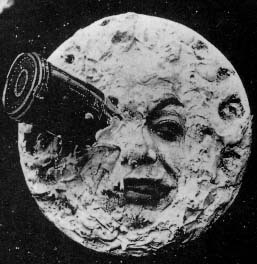 My sister and I have embarked on a science fiction-movie bender this week, and one of the gems she introduced me to was A Trip to the Moon, the first SF movie ever, directed by the amazing Georges Méliès. The Wikipedia gods tell me the movie was based on two novels, H.G. Wells’ The First Men on the Moon and Jules Verne’s From the Earth to the Moon. Also, check out An Astronomer’s Dream by the same director. It’s a beautifully surreal fantasy piece and only 3-mins long. Treat yourself.